Depending on existing HR infrastructure, payroll system requirements will vary. Businesses with a human resource solution already in place may only have a need for pure payroll functionality. In contrast, companies with unsatisfactory HR software could rely on the adoption of a new payroll system for more comprehensive features like workforce management, tax services, reporting and compliance management. General human resource management features provide additional HR tools not specifically related to payroll. Employee information regarding history, performance, compensation and benefits is stored in a database where all HR resources can be easily accessed by managers and team members. Users can view and update personal information and oversee HR functions on their own. 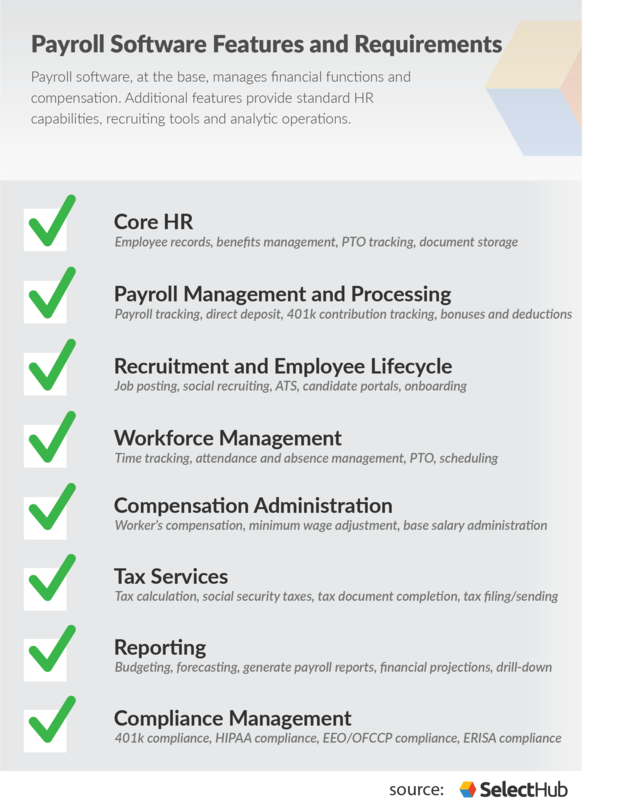 With a comprehensive payroll system, HR departments can consolidate all needed functions into one software, saving time and money. The central function of payroll software, management and processing tools ensure all employees are properly compensated. Payment is issued through digital and printed methods on a daily, weekly or monthly basis. The software factors in bonuses, deductions and contributions for 401k and insurance. Moreover, HR managers can view all processes in a dashboard setting. Some systems include analytical capabilities along with data visualizations which provide insight into a company’s payroll processes. A business can use payroll insights to evolve policies over time. 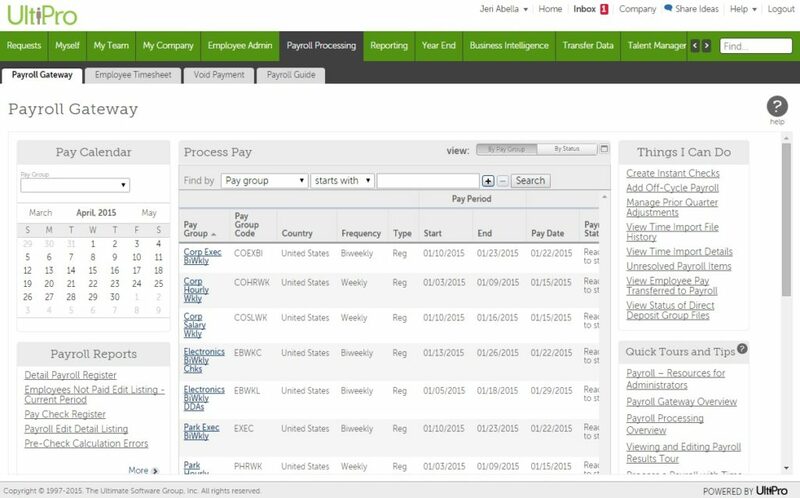 An example of UltiPro’s payroll management functionality. From the posting of a job to an employee’s first week and beyond, a recruitment and employee lifecycle management system can handle all processes. Employers can advertise position openings on job boards and social media and track candidate progress until the role is filled. Once a candidate is chosen, a comprehensive payroll system can manage new employee processing to ensure a streamlined onboarding experience. Scheduling tools record employee hours and absences in a centralized location. Managers can create schedules based on worker requests and view time tracking data within the software. Furthermore, notifications inform employees and managers of any changes, making scheduling a collaborative effort. Automatic calculations of overtime, premiums and differentials are included in the workforce management of many payroll systems, providing proper compensation as a result of accurate time tracking. Compensation administration features calculate payment details, starting with initial salary agreements and adapting to changes throughout employment. This includes adjustments for minimum wage raises, bonuses and premiums. Simply put, the goal of these features is to implement proper compensation plans, factoring in all elements that affect payment. Payroll software provides accurate payment deductions and tax calculations on financial transactions. In conjunction with compliance management tools, payroll software notifies users of any upcoming deadlines or law changes that could be a cause for error if unchecked. Equally important, the filing of tax forms such as W-2s and 1099s is automated for timely completion without mistakes. Payroll systems handle the entire process of tax form completion and submission, either digitally or with the help of support. Relying on payroll software for tax functions ensures accuracy without the need for additional work from human resources or accounting, and, as a result, less possibility for human error. Comprehensive tax services included in a payroll system save time, money and labor, and add efficiency to the tax process. Business intelligence features present payroll data in the form of reports, providing insight into current processes. Furthermore, in addition to simply observing present trends, human resource departments can interpret findings to predict future payroll data and make decisions based on those predictions. Alerts for Upcoming Performance Reviews, Overtime, etc. Payroll reports from RUN Powered by ADP. Compliance management features monitor local, federal and global standards to ensure all processes follow necessary laws and regulations. A complete system will account for all locations of a business and adjust compliance measures accordingly. Compliance is automated, complete with notifications that alert users of any changes to relevant regulations. Staying up-to-date on legal statutes when handling financial transactions and contracts maintains a standard of efficiency. The goal of compliance management is to serve as a kind of control over any legal parameters that relate to the software functions. Compliance management works in the background of other features, so users can focus on business processes without worry. The consideration of desired features begins the payroll software buying process for many businesses. With our payroll system implementation checklist, having a firm grasp on requirements creates a portrait of the perfect payroll software vendor. With this idea in mind, buyers can start looking for and comparing software that best fits their vision. Which of these features are most important to your business? Is there a feature you need that isn’t on our list? Leave a comment and let us know! Business software with the various features listed could help businesses with operations and data collection of various sources, programs. I found it interesting that you say that the central function of payroll service is to make sure all employees are properly compensated. My brother is thinking about switching form manual time cards to a payroll system. I will send this information to him, so he can look into it more. Hi Nathan! I’m glad you found this information useful, thanks for taking the time to leave a comment.